A guest post by Mark Broatch. Nice to get a poetry collection commissioned and published in the UK. But a follow-up? Doesn’t happen. Shoestring Press put out Peter Bland’s Remembering England in 2014, presumably to coincide (ish) with the 60th anniversary of the end of the war. It mined Bland’s smog-filled memories of the 1930s, 40s and 50s as well as the odd one from the 1970s and beyond. In London Grip, an independent online “cultural omnibus” with a special interest in poetry, John Forth said of it that the poems “are marked by an artfully fluent directness which tries to go unnoticed but creates a lasting effect, their meaning being very much the meat thrown by a burglar for the dogs”. Bland writes about a “lost generation”, he says, “their main gifts being ironic detachment, never taking themselves too seriously and the sense of humour that made us”. They do what the book’s title suggests, focusing on the England the poet knew, or rather, the two Englands: that of his childhood and youth in wartime, and that of his middle age in the 1970s, after his return from sixteen years in New Zealand. […] We see the boy in the bomb shelter: ‘Draw more ships,’ Grandma ordered, / keeping us busy between exploding bombs./ So we did, on wood-flecked wartime paper…/ The best were hung in old photo frames’. The violent backdrop is almost (but not wholly) inconsequential before the affectionate memory of children competing to see who could draw the best and win Grandma’s favour. 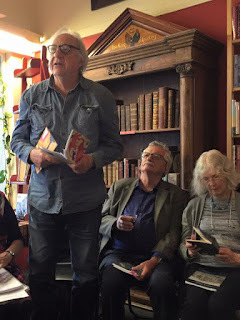 Shoestring specialises in publishing poetry collections “by established but unfashionable poets” or those who might be well known elsewhere but new to British readers. “Not particularly fashionable” is the style of the new collection, Working the Scrapbook, says Bland, again heavily relying on the personal. It again uses what he calls “the first person plural” — it’s just another persona, he reckons, like the partly fictional voice of a memoir. But for him, it’s “where the real feeling comes from”. The title? Bland has long kept scrapbooks, pasting in letters, photos, articles and reviews, family “stuff”, poems sent to him, art images and other gatherings. Often a poem will arise from looking at an old photograph, he says. The second part of Working the Scrapbook includes the poems of Loss, the 2010 collection he wrote after the death of his wife Beryl, and a couple of new ones. For the six decades he has been writing poetry, Bland has had a foot in both New Zealand and the UK. In 1977 he won the Cholmondeley Award, a UK Society of Authors prize that has also been given to Seamus Heaney, Derek Walcott, Philip Larkin, Fleur Adcock, Kingsley Amis, Allen Curnow and Alice Oswald. In 2011, having settled permanently back in New Zealand, he was awarded the poetry category of the Prime Minister’s Awards for Literary Achievement. 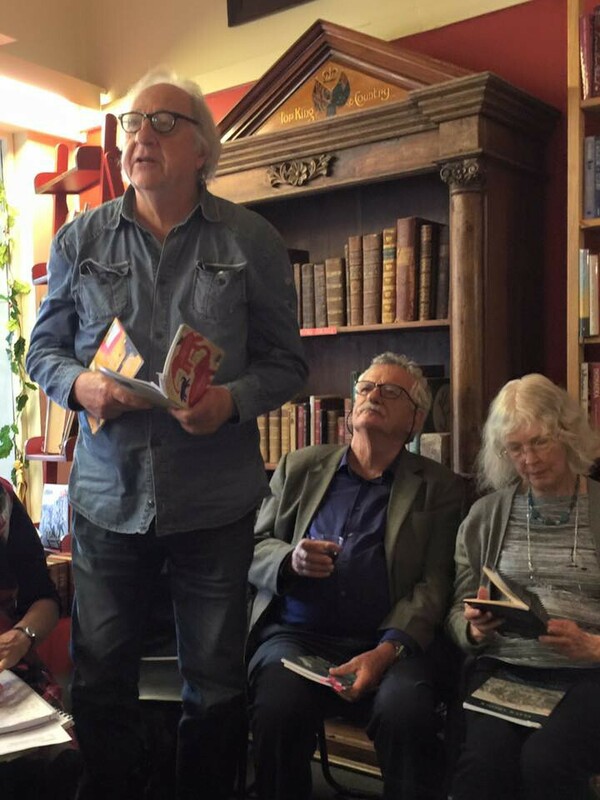 Health problems prevent him from going to the launch of Working the Scrapbook on 30 June in London, but he says fellow poets Kevin Ireland, Fleur Adcock and CK Stead will do the honours and read some poems from the book. Coincidentally, the latest issue of local poetry journal Broadsheet, edited by Mark Pirie, highlights Peter Bland’s work. The issue includes tributes by friends and colleagues, including Fleur Adcock, Glenn Colquhoun, Marilyn Duckworth, Riemke Ensing, Michael Harlow, Kevin Ireland, Louis Johnson, Kapka Kassabova, Bob Orr, Vincent O’Sullivan, Elizabeth Smither and CK Stead. The Argentinian poet Borges admits that there’s a need among poets ‘to be familiar with the renowned uncertainties of metaphysics,’ but only in order to make the best use of staying open to experience, and ‘to help pass on what we don’t know as much as what we do.’ The sources of poetry are as ancient as cave paintings and the modern poet still has to have something of the shaman left in him in order to be able to indulge in a little cave talk and to commune alone with the deeper sources of his imagination. Here is Peter’s bio at the Academy of New Zealand Literature. His most recent publication in New Zealand is A Fugitive Presence (Steele Roberts, 2016); Elizabeth Coleman reviews it for Takahe here. Copyright Licensing NZ invites writers of fiction and non-fiction in all genres to apply for the CLNZ/NZSA research grants. There are four available: priority will be given to “projects of national or significant local interest and/or those that add significantly to the field or genre on a subject”. Three of the grants are for $5000; the fourth includes the $5000 plus a six-week residential fellowship at Victoria University’s Stout Research Centre. The access to the archives was truly invaluable as it got me to the centre of the research. If you’re looking for New Zealand history, you have to go to Wellington. Delving into the archives, you never know what you’re going to find. I found myself in the middle of intellectual debate and working with other people in similar fields can get you involved in really stimulating conversations. Applications for all four grants close at 4pm on Friday 21 July. Full details and guidelines are at the CLNZ website here; you can even submit your application online. From the edition of Friday 16 June. As always, spelling, punctuation, grammar and logic are exactly as printed in the Waikato Times. I see that some schools are banning all drinks at school other than milk and water. To some people that may seem sensible, the way to go even, but it is only a short step from that to inspecting lunchboxes and dictating exactly what a school lunch shall consist of. Social commentators are preparing us for the choice-less future which will make individualism a sin. It will be a robotic future where no one will excel and no one will under-achieve. Sport or competition of any type will be pointless, because no one will be keeping score, in case it will offend a “tomorrow” of no winners – no losers. Perhaps in such a highly regimented and regulated “tomorrow” we can stack populations of billions into accommodation built for millions, while androids do all the work for us and even improve our systems to the extent that all innovation will be their domain, not ours. Perhaps mankind will then find his true place in the universe, alongside all of the other bacterium and viruses. Will a past membership of Mensa or a Nobel Prize in a family tree become a great cause for shame? Perhaps there is a cosmic truth finally dawning. Perhaps it is not about us after all. I doubt there is any genre or era to which Richardson could not apply her virtuosity: her knack for inhabiting the minds of others, especially women in duress, is uncanny and hypnotic. Through the Lonesome Dark has been on the NZ bestseller list since its launch, and my reckons are that when it starts to circulate around the book clubs it will find a whole new readership that will carry on and on and on. Bunnings, like Rohan Long, is Australian, which makes it baffling that they would trial these garden gnomes modelled on Sir Geoffrey Palmer (who was briefly 33rd Prime Minister of New Zealand, from 8 August 1989 to 4 September 1990) there. They cost $59 in Australia. Why can’t we buy these here? And what would the local price be? 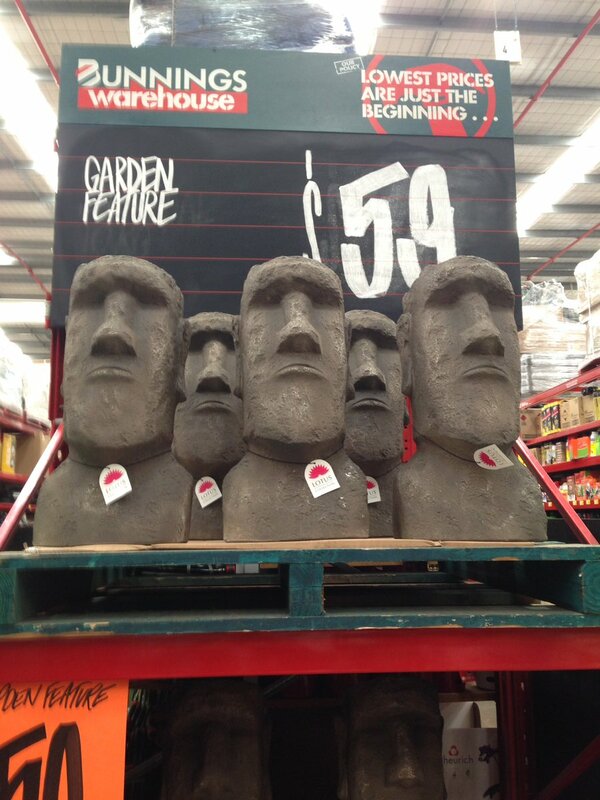 A friend in Hamilton reports that Bunnings Te Rapa has these in stock. We have a suitable place in our garden, so I shall go tomorrow to check it out. In my main office – Red Cherry café – this morning I had a conversation with a very nice man who had this week buried two goats. His mother-in-law’s goats, which had died for no obvious reason, so he had to deal with them by digging deep holes somewhere on the farm, bunging them in and covering them with soil. One of them had rigor mortis, which made things awkward, burial-wise. I arrived just after he had received a phone call to say that another of his mother-in-law’s goats had died, so he was setting off to bury it. “She has three more,” he said gloomily. He must be getting good at this: he had buried a (dead) alpaca previously. If you know alpacas, they are intermediate in size between a goat and a horse. He knew all about dealing with dead horses on land. You get a truck with a winch, or something. I never had conversations like this in all my years in Auckland. Paddy Richardson’s new novel storms straight into #3 place in its first week in the Nielsen bestseller list. Through the Lonesome Dark (Upstart Press, $24.99) is not crime fiction this time but literary-historical, about family and friendship, love and loyalty, the coal mining life in Blackball – and the hell that was the Western Front. It is brilliant. It made her agent cry – and you know how tough those cookies are. I particularly recommend page 295 in which – spoiler alert – she says nice things about me.